This book is dedicated to the protection of horses, ponies and donkeys and is based on first-hand international experience from a lifetime spent with horses – hunting, racing and welfare – whether with The Pony Club, The Jockey Club or international horse charity. The UK alone has more than 1 million horses and ponies which indicates we like them, and yet we also have more sanctuaries and welfare centres for horses than any other animal, which suggests we also abuse them. Horse Welfare, Use not Abuse is about all equines from The Pony Club to the highest levels of performance – racing, show jumping, eventing and endurance riding. 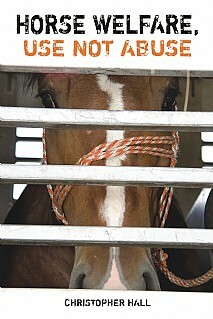 The book challenges all horse and pony owners to care better for their animals. In the developed world we abuse our defenceless horses because we can, while in the developing world there is also abuse, but it is out of desperation for survival and ignorance of how to do better. In his travels, Christopher has met the leaders of most of the equestrian sports both nationally and internationally. Stories about some of these are featured, as well as anecdotes about the work of World Horse Welfare, calling on his role as a leading regulator, chairman of World Horse Welfare and lifelong horseman. From a position of authority – he held one of the highest profile jobs in the Jockey Club, steward in charge of enforcing the rules of horse racing – he provides an insight into the high stakes world of racing where winning is everything. In a sport where controversy is never far away, he calls for tougher measures to fight drug abuse. He condemns outright all those who use drugs to achieve victory, suggesting that cheats are banned for life from equestrian sport. He believes the real victims are the horses. There is a warning to the professionals in the sport that they have a duty of care not just for the horses, which are the real stars, but for the sport they enjoy. The author calls for closer attention to be given to horses, donkeys and mules in the developing world as they are the backbone of the poorest countries; they are often the only means of transporting people and goods, the only power with which to work the land and, far from being a luxury, are an absolute necessity for their owners’ survival. Horses are beautiful animals that can work with their owners to the best effect; it is only right that they should all be cared for with respect so that the partnership is more equal, one of working together and free from abuse. A revealing book that should be of huge interest to all owners and riders of equines, whether in pony clubs, members of the British Horse Society, the racing community and anyone concerned with the welfare of horses, ponies, donkeys and mules.